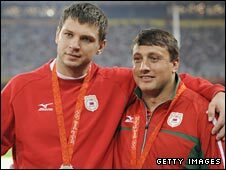 Belarus hammer throwers Vadim Devyatovskiy and Ivan Tsikhan have been stripped of their Olympic silver and bronze medals for doping offences. Devyatovskiy, who served a two-year ban in 2000-02 and now faces a lifetime ban, and Tsikhan both tested positive for abnormal levels of testosterone. Tsikhan, the 2004 silver medallist and a three-time world champion, faces a two-year ban for his first offence. The silver now goes to Krisztian Pars and bronze to Koji Murofushi. Slovenia's Primoz Kozmus won the gold medal. Both Devyatovskiy and Tsikhan denied the charge but were found guilty at a hearing in front of the International Olympic Committee disciplinary commission in Lausanne in September. It is the second time Murofushi, from Japan, has benefitted a rival's doping misdemeanour. Four years ago, he was upgraded to the gold medal in Athens after Hungary's Adrian Annus was stripped of first place. The ICC also disqualified Polish canoeist Adam Seroczynski, who was out of the medals in the flatwater K2 event in Beijing. Seroczynski, who was fourth in his event in Beijing, tested positive for the steroid clenbuterol. The three cases bring to nine the number of athletes caught for doping in Beijing. The IOC disqualified six athletes during the Games - Ukrainian heptathlete Lyudmila Blonska, Ukrainian weightlifter Igor Razoronov, Greek hurdler Fani Halkia, North Korean shooter Kim Jong Su, Spanish cyclist Isabel Moreno and Vietnamese gymnast Thi Ngan Thuong Do. Blonska was stripped of her silver medal, while Kim had his silver and bronze medals taken back.